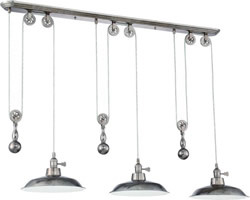 These multiple pendants can be used in place of a chandelier in a contemporary or modern dining room. They can be used with a high ceiling and hung at different heights. Use only one canopy to suspend multiple pendants over an island or bar. A collection of pendants suspend from a single canopy. Use these in place of a chandelier, lantern or pendant. These unusual pendant clusters are an ideal focus for many interior designs. A Series of pendants suspend from a single canopy. 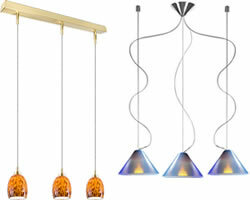 Use these pendants instead of a Series of small pendants or as a chandelier over a long table. Linear, circular or square canopies in Bronze, satin nickel, chrome or other metal finishes suspend an incridible selection of glass diffusers. Select the options that best coordinate with your interior. Holtkotter mini pendants and multipendants combine form and function with German engineering. 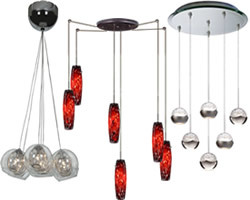 These modern and contemporary pendants are perfect for home or business. Following the Bauhaus school, these pendants are high style. Design your custom multiple pendants. Select single or multiple canopies in your choice of finish, then choose from a wide assortment of glass options. Also available for track lighting or monorail lighting systems. Breathtaking clusters of sparkle and brilliance. A myriad of glistening crystals add an exquisite touch to the most sophisticated decor. Modern lighting developed with proprietary LED technology and old world artisanship. These elegant pendants add more than just ambiance providing generous light sufficient for tasks. Smaller Pendants in in a variety of styles. Hang a small pendant over your kitchen sink to coordinate with your chandelier. Hang a Series of Mini Pendants over your bar, kitchen island or long dining table.